Wall Street and European stock markets put in solid gains on Wednesday, with the S&P500 extending the advance from the breakout earlier late last month – see below. The major US indexes finished higher on Wednesday. The Dow led with a 1.4% gain, while the S&P 500 advanced 0.86% and the tech-heavy Nasdaq index added 0.67% to hit a third consecutive record high. The small-to-mid cap Russell 2000 index added 0.68% for the day while the Dow Transports gained 0.64%. Comments from the ECB around withdrawing and easing stimulus measures pushed bond yields higher across Europe, and this buoyed the markets with the US financials catching a strong bid. The US 10 Year bond yield pushed higher to 2.97% and looks on course to be soon back above 3%. Wall Street now sees this as being “more of a positive endorsement” of the underlying strength in the US economy, and supportive of the banking sector, which drove Wednesday’s rally. 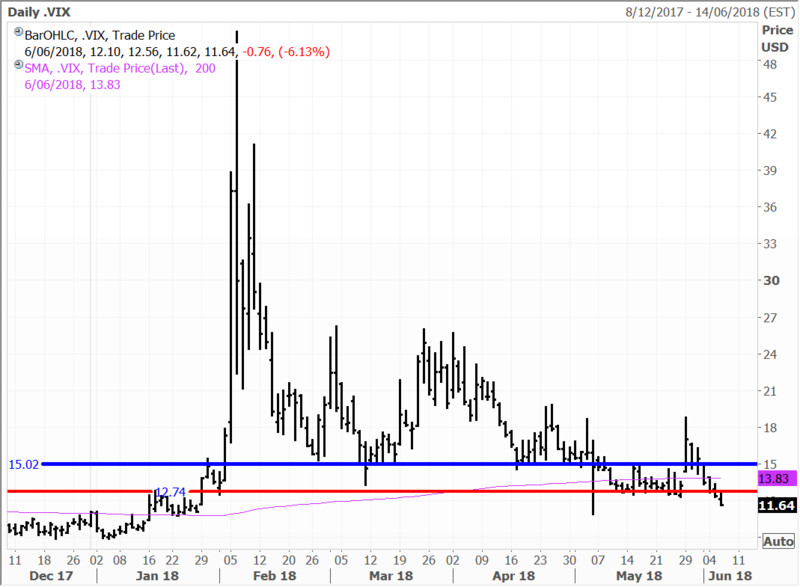 Volatility dropped back to the lowest level seen since December with the VIX falling more than 6.5% to settle at 11.6. Sentiment has recovered since the corrective selloff as investors “head back into the water” with “risk back on the table”. 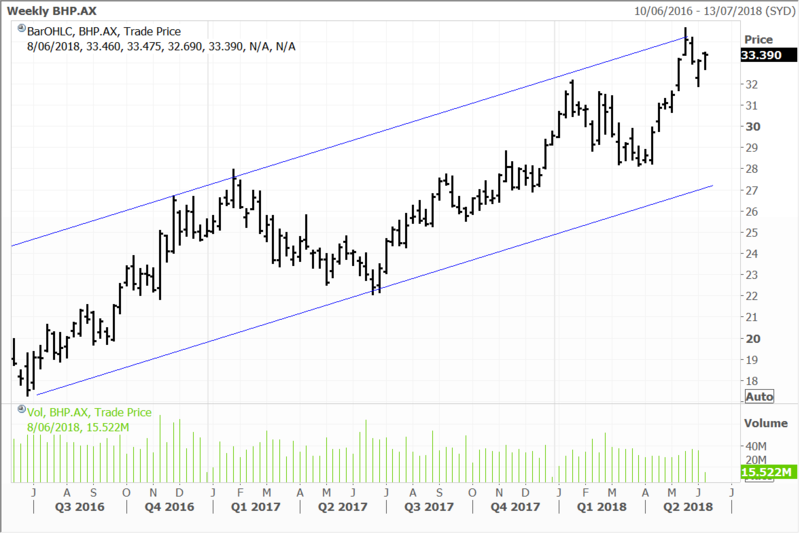 All eyes will soon turn towards the June quarter reporting season which could see the Street recalibrate earnings well north of $170B, which prices the S&P500 on a fair 16X multiple. I think this sets the S&P500 up to challenge the January record high, particularly if there are no upsets on the North Korean and global trade fronts – which I don’t think is likely with the Trump Administration’s “negotiating style” much better understood by the markets. The FOMC and ECB meetings are to be held next week, where we will more than likely receive a rate hike from the Fed – which is close to 100% priced in – but also “steady as she goes” rhetoric with inflation yet to pose a substantial threat (the second half of the year could be a very different story). 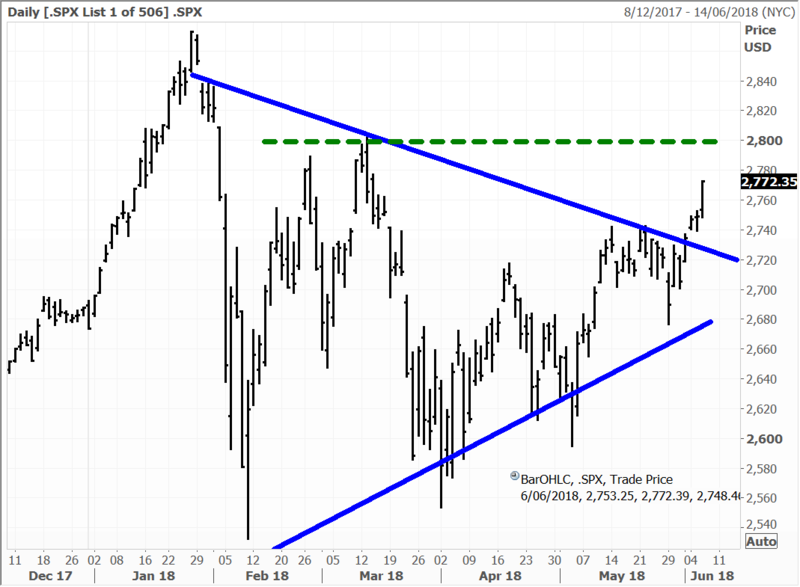 Key resistance with the S&P500 lays at 2800 which is now within clear sight, and all the markets need to be convinced before the “big push higher” is the right catalyst – of which many are brewing. I think the “big push” is only a matter of time and probably a late June or July story as the corporate sector begins to report June quarterly results. The overall mood of the markets has certainly improved (albeit many fund managers are still cautious after the deep selloff), with even Tesla backing away from a “failed downside break” and lifting 10% above the danger zone. The bears and shorts scrambled for cover on Wednesday. Marking a stark turnaround, as it was only a month or so ago that investors were concerned about Elon Musk camping out on the factory floor, and that the factory production numbers were going to miss badly. Disney (+2%) and Comcast (+3.8%) shares both gained on Wednesday. Behind the scenes executives at the companies and investment bankers employed by them must be burning the midnight oil as they each develop strategies about how to best gain control of Europe’s largest pay-TV operator Sky and most of 21st Century Fox’s other assets. As touched on yesterday, British authorities this week gave the go-ahead to 21st Century Fox’s bid to take over pay-TV operator Sky, with the condition that Sky News be sold on to a third party like Disney, which Fox has already agreed to. The decision also gave the green light to a rival bid from Comcast (-0.7%), paving the way for a showdown and bidding war to gain control of the business. US-listed Baidu shares advanced 1.5%, taking the gain over the past week to 7% as shares of its separately listed video streaming platform again surged with Baidu also benefitting from positive news flow. In separate economic news, construction activity in Germany grew at its fastest pace in four months in May according to IHS Markit data. The construction PMI reading surged to 53.9 in May, up from 50.9 in April. The pan-European Stoxx 600 was flat for the day, while the Euro Stoxx 50 index of Eurozone blue-chip stocks added a marginal 0.12%.The Contrarian Fund holds short positions on the German Bund market. In Japan, the benchmark Nikkei index edged up 0.38% as technology stocks followed the lead of their US counterparts higher. Market gains were limited though given trade tensions and geopolitical risks. Prime Minister Shinzo Abe is set to meet President Donald Trump tomorrow. Traders were also likely cautious as they wait on the Fed decision next week on interest rates. Sony shares continued to rise, advancing another 2.8% as investors keenly anticipated a string of upcoming video game announcements from its PlayStation unit. Most consider Sony’s PlayStation already has a superior line-up of games versus the Xbox and this has seen the PlayStation far outsell its rival. 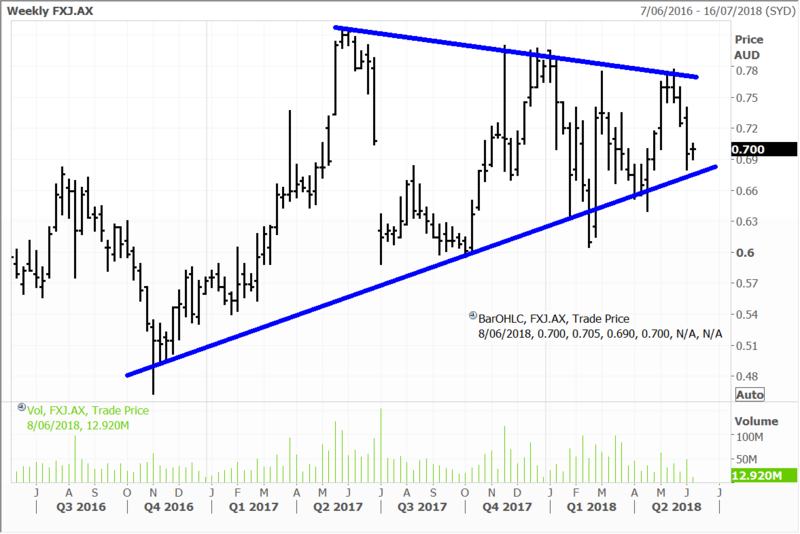 A weakening of the yen and news that Sony/ATV owns a stake in Tencent’s Music business due to list later this year also helped. Financial stocks were laggards with megabanks Mizuho, Sumitomo Mitsui and Mitsubishi UFJ effectively flat to slightly lower on the day. Subaru dipped 1.4% after saying it found more cases of data fabrication. Sharp (+0.9%) edged up as it agreed to buy Toshiba’s personal computer business for just ¥4 billion, or $36 million. The Shanghai Composite (+0.03%) was effectively flat and the benchmark Hong Kong index advanced 0.53%, marking its fifth straight day of gains. In Hong Kong, technology stocks led the way north and energy shares also relatively outperformed. ZTE Corp has reportedly agreed to a deal in principle that would result in the lifting of US sanctions preventing it buying components from US suppliers. Lens maker Sunny Optical shares surged 4.9% on the news as ZTE is a major customer. Tencent Holding’s recovery continued with another 1.2% advance. In Australia, the market had a positive session on Wednesday, helped along by the March quarter GDP print which was ahead of expectations. The ASX200 added 30 points, rising 0.5% to close at 6025. As I suggested yesterday exports are providing much of the momentum for the economy, with the resource sector figuring prominently. Demand is strong, as is pricing, and we see this continuing to act as a tailwind for the big producing names. BHP and Rio (we remain significantly overweight in the Australian and UK managed account portfolios) were well bid, with gains of 2% and 2.5% respectively. Appetite is likely to remain firm with copper prices hitting a three-month high. I have regularly made the point that supply is tight for a host of commodities across the spectrum. This is certainly true of copper as evidenced by the reaction to the prospect of industrial action at Escondida, the world’s largest producing mine. Workers at the mine (co-owned by BHP and Rio) are threatening to repeat last year’s 44-day strike, and are demanding the largest one-time bonus in Chilean mining history. This would be a meaningful interruption, with Escondida accounting for almost 5% of global copper supply. Whether resolved near or medium-term it highlights the supply challenges faced by copper, and many other commodities. This is certain to keep tension in pricing, and with inflation generally set to act as a driver. Oil is a different case, but also similar. Supply constraints owe more to the collective decisions of OPEC and other large producing countries. 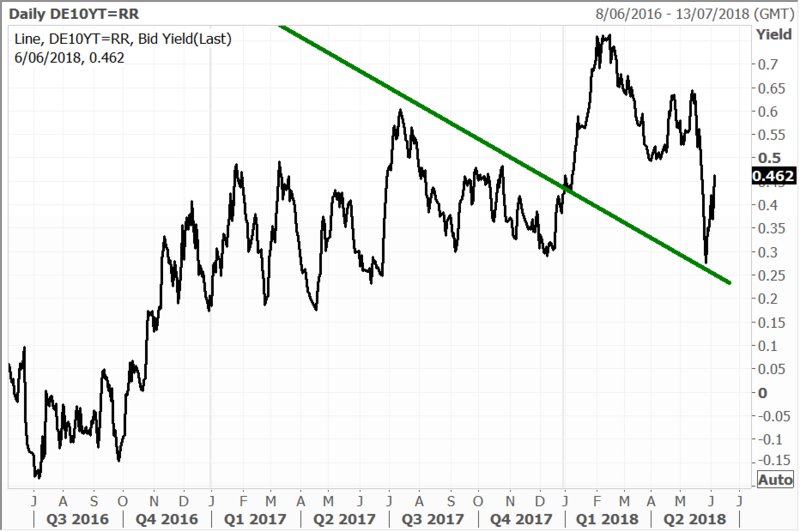 I believe that economic self-interest will prevail (with the taps not being opened ‘too’ much), and that the recent correction in oil is likely finding a floor. The inflationary angle is also very much present as I have explained. Energy stocks also had a strong session yesterday with gains of 2.6% and 2.8% for Oil Search and Woodside respectively. We hold both stocks in the managed account portfolios. The muted output response of non-traditional supplies including shale has also been unsurprising given that OPEC holds all the cards. Investment here takes time and commitment. It is also easier to buy existing assets which explains the significant interest in BHP’s shale unit. First round bids from oil majors have reportedly come in between US$7 and US$9 billion. And as we have premised, the resource sector is continuing to have a large say in the strength of the Australian economy. This was clear in the GDP print yesterday, which rose 1% over the March quarter, equating to growth of 3.1% on an annualised basis. This comfortably beat expectations of around 0.9% for the quarter (and 2.8% annualised), which was the strongest since 2011. The data will be pleasing to the government, as well as the RBA which is looking for a GDP growth rate in 2018 of “slightly above 3 per cent.” Still there are reasons for the central bank to remain cautious, with household consumption rising by a weak 0.3% during the quarter against the backdrop of an indebted consumer, and low wage growth. The A$ rose on the print, but realistically, I don’t see the RBA raising rates for well over a year.